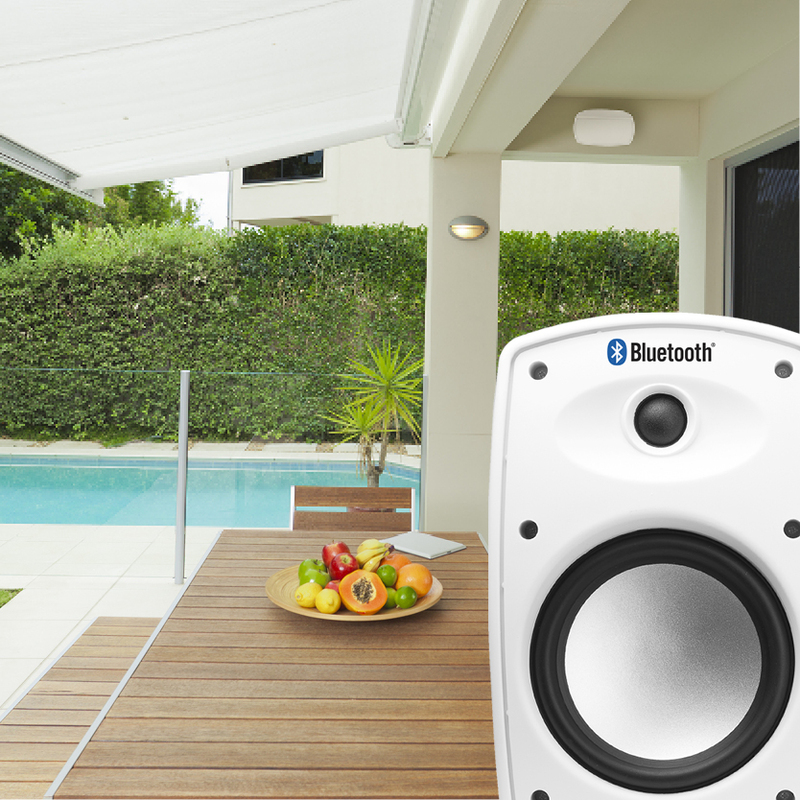 Sleek, modern and attractive, the BTP-650 Wireless Bluetooth® Patio Speaker Pair is a fantastic set for your deck or patio. 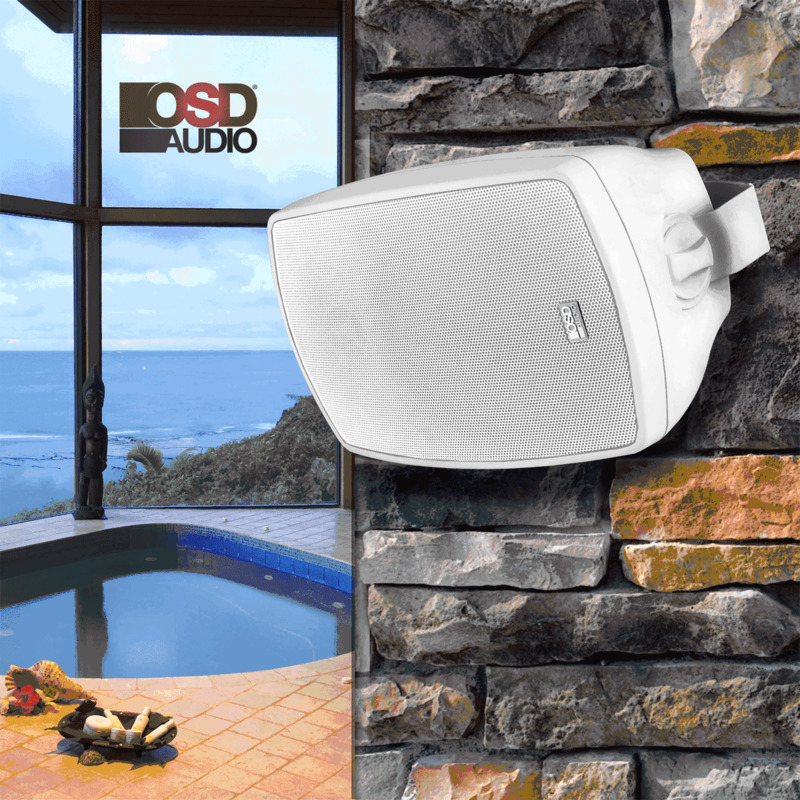 These indoor-outdoor speakers are designed for all weather conditions, and the set includes one main speaker and one pairing speaker. They're versatile enough to be used in stores, as part of your home entertainment package or near your pool. Powerful and ready for anything you can play, these speakers connect to any Bluetooth®-enabled device and include 25 feet of speaker wire. 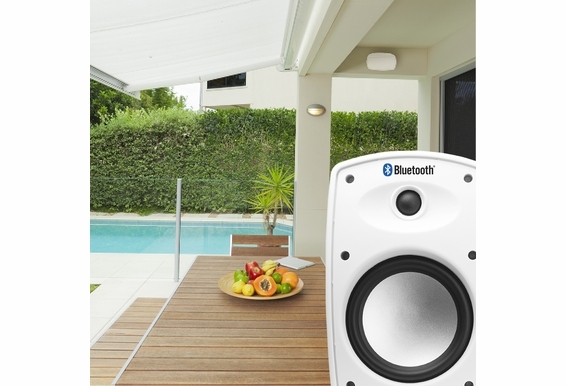 Plug to Transformer - 3' 5"
Transformer to Speaker - 15' 5"
1) Determine the ideal location where the Patio Speakers are not exposed directly to the elements. Note: speakers typically should be placed between 8 to 12 feet apart for proper stereo separation. 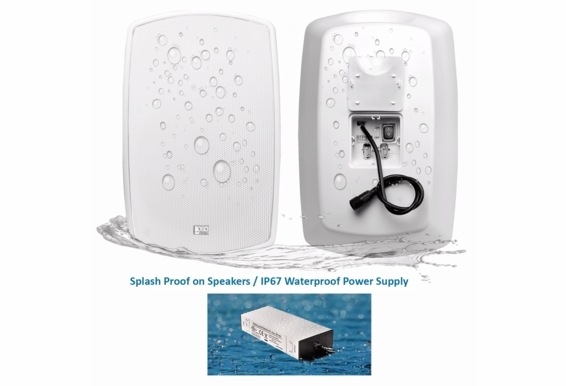 2) The Master Patio Speaker needs to be located near an AC outlet where you can connect the Power Supply to the Master Speaker in order provide the electrical current needed for the Internal Stereo Power Amplifier and Bluetooth® Receiver. 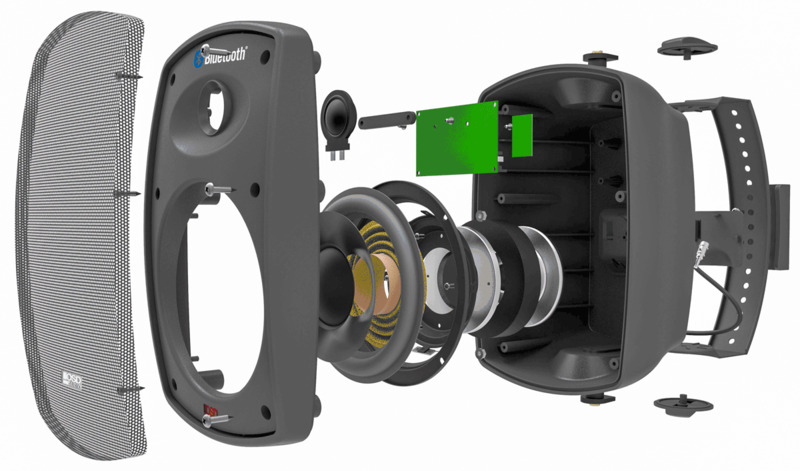 3) The Pairing speaker must be connected to the Master Speaker with the 25-foot Speaker Cable that is supplied with the kit. The length of the speaker cable can be cut down for an exact fit but should not be extended beyond 30 feet. 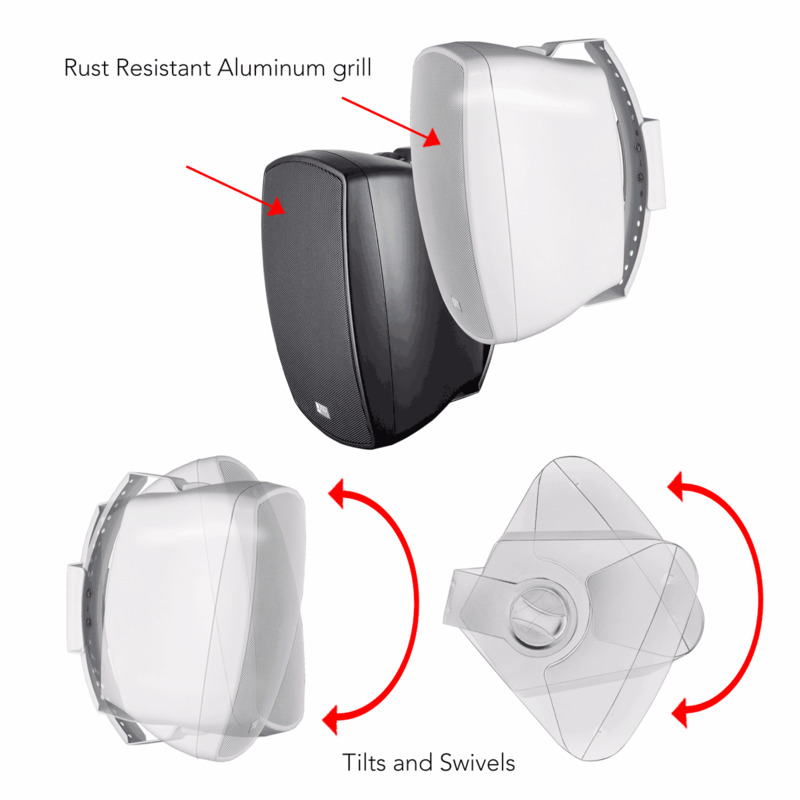 Do you have replacement grilles for these speakers? How so I locate them. Do these speakers have mounding brackets to attach to ceilings or walls? could they be hard wired to a receiver if desired, like a regular non wireless speakers. What color is the speaker cable for the white speakers? If you buy 2x pairs (4 total speakers), when you connect via bluetooth will all 4 play? Or only 1 pair? Hi David: How long has it been working before now? Does BT Speaker show up on your list of available devices? Have you tried turning off the power on the back of the master speaker; or unplugging the power supply for 30 minutes? can the volume be adjusted on each speaker so one is not as loud as the other ? I see these can be mounted horizontally. I also see the enclosure panel on the back is vertical, with a small opening at the bottom. If I do mount them horizontally, do I need to worry about rain getting into that opening? Can these speakers not only be hard wired, but used with Bluetooth as well? I received these speakes today I need to extend the speaker wire 10 more feet Can I just get a bigger gauge? If not ,do you have suggestions? 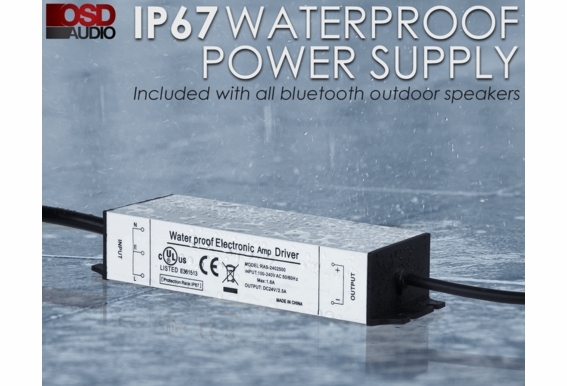 What is the diameter of the weather-proof power connector? I ordered these yesterday and am looking to install conduit for the power cord over the weekend; can I fit the power cord through a 1/2" conduit (0.62" ID)? Thanks. can the power supply be on a switch,and turned on only when speakers are in use? I will assume the individual switch on each speaker should not be powered up when not in use. These speakers will be mounted under over hanging soffit about 8 feet off ground . Iâ€™ve been having skipping problems recently with two different iPhones that have not had a problem before. Both phones only skip when connected to these speakers, work fine on all other BT devices. Doesnâ€™t matter what app is used or if the phone is rebooted. I can not get my BTP-659 speakers to pair with my iPhoneX. I have tried several times by powering off, but nothing. The unit is on by indication of a blue light on the front left side of the powered speaker. Thank you for your time. I have a pair of BT650 speakers on my deck. Very happy with them unfortunately something cheeed the wires from my powers supply - model FY2403000. Is there any way I can replace this component? 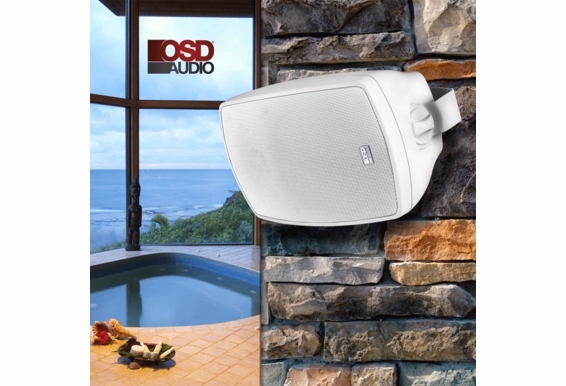 I would like to buy several pairs to mount above my outdoor patio and upper deck, and simply want them to connect to my indoor Echo devices to take advantage of my music unlimited subscription. Will these connect directly or must I purchase a separate Bluetooth transmitter? Will these speakers connect to and work well with Amazon Echo devices? Do these speakers work with a Sonos system: Re: setup as one Sonos Zone? 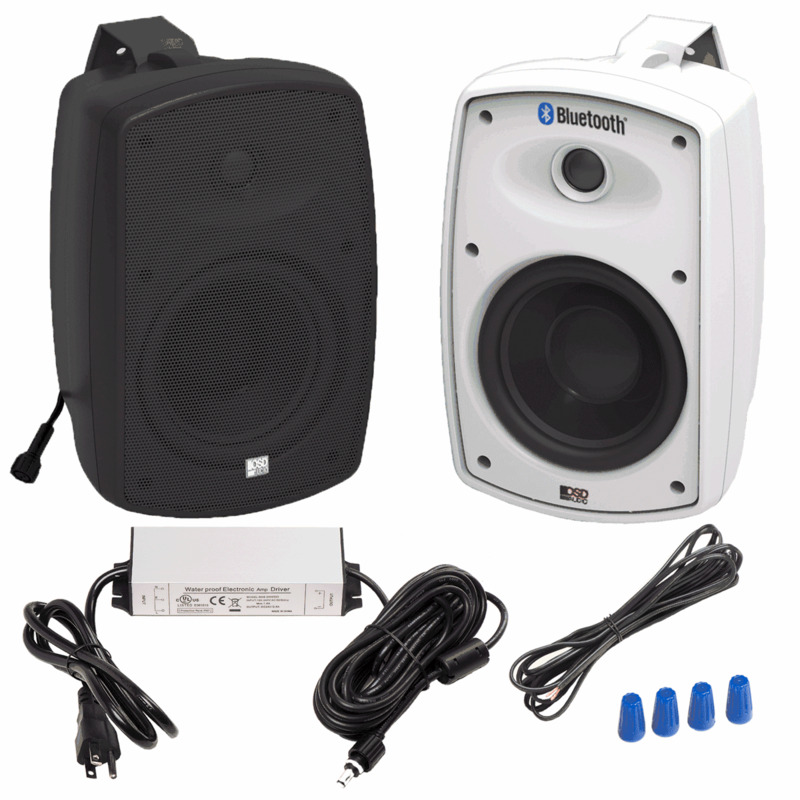 I have three sets of BTP650 speakers with the previous power adapter. The power adapter has died and I need a replacement. 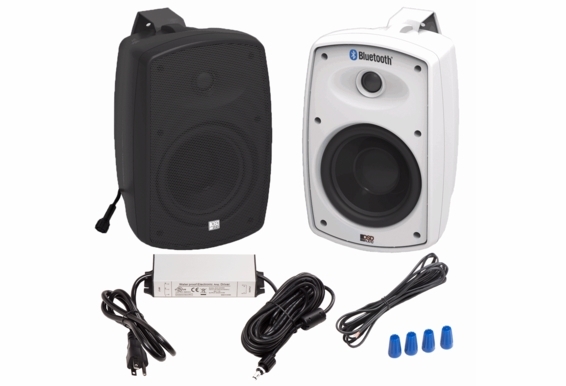 Where can I purchase a replacement, and/or will the newer version of the power adapter fit the BTP650 speakers that I have? If so, do you sell the power adapter? 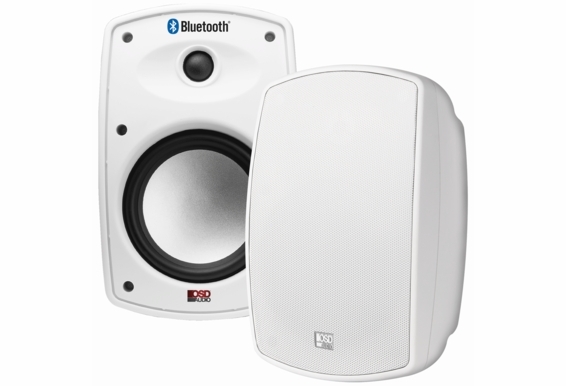 If you use a Bluetooth adapter connected to a RV to pair with these speakers, how is volume set? Would it just be at a level that is a holdover to say a mobile phone pairing? How do you disconnect a paired device if it is not available? For example, wife phone was paired to speaker yesterday. Today husband wants to pair to speaker. Hello. Is there anyway to connect these to a non-BT tv? Like a device I can buy to connect to the tv, that then connects to the speakers. Thanks for any info anyone can provode. 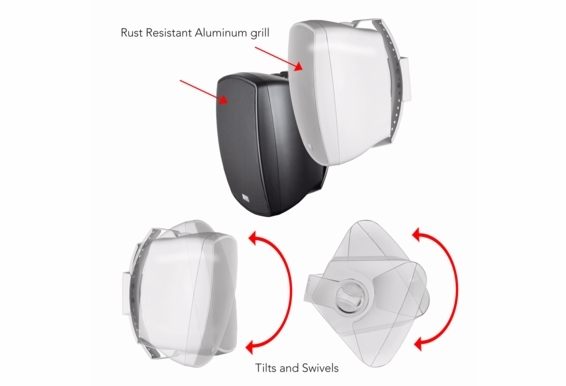 I don't see where it says these speakers come with the mounting brackets, however the picture shows they do. Do they actually come with the mounting brackets? How do you connect the two speakers together? I do not understand how the cables supplied work or what type or connector I need to buy..
what is the voltage of the power supply and or requirements for master speaker? 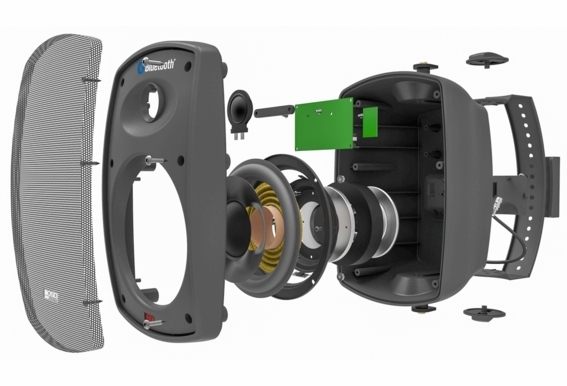 can a subwoofer be connected to these speakers? Hi, shipping cost to Puerto Rico USA Is free? If no, who is more cheap? Many thanks!!! 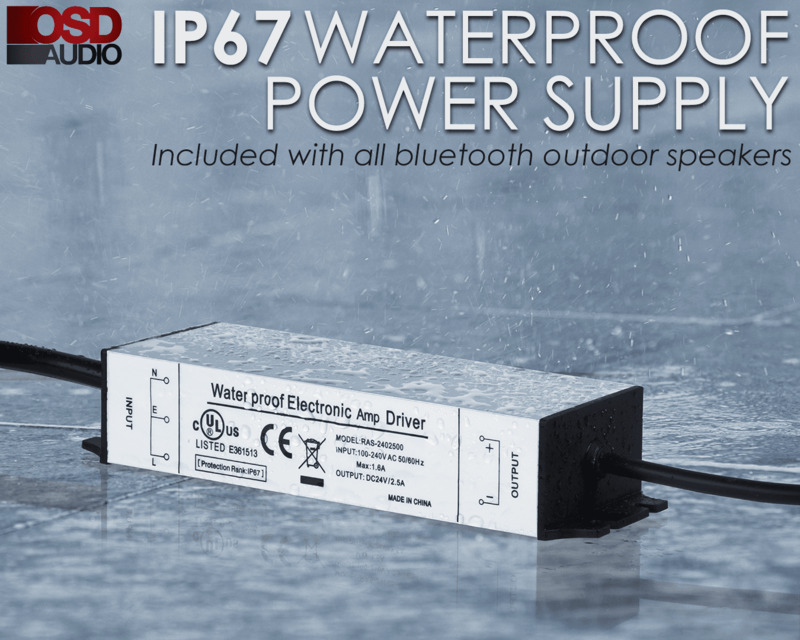 When will the BTP-650 be back in stock? I want to buy another set!!! If I get a call while streaming music through my phone, will the call come through the speakers? I own a pair of these and love it. But I have an issue. Can I add a 3rd (and possible 4th) speaker to the loop? Since I can only connect to one Bluetooth device at a time, if I were to buy another pair I wouldn't be able to simultaneously play it, correct? Please advise. Anyway to make these louder? Using an iPhone, sound is decent but not quite loud enough. Can you connect these to a TV? Also, do you have to power them on each time you use them? I planned to mount near ceiling. Is the estimated obstructed range of the bluetooth reception accurate? I want to place these on my patio and connect them to the Yamaha receiver in my living room. They will be about 40 to 50 feet away and the bluetooth will need to carry through 1 interior wall and then a 2nd exterior brick wall. I had different bluetooth speaker advertised as good for 100 feet. Inside it worked with the receiver, but it dropped as soon as I walked the speaker out to my backyard. Thanks. Will these pair with a blue tooth transmitter hooked to a stereo receiver? Does sound quality and volume improve if you are using a stereo receiver to stream from instead of a phone with aps such as Pandora or Spotify? 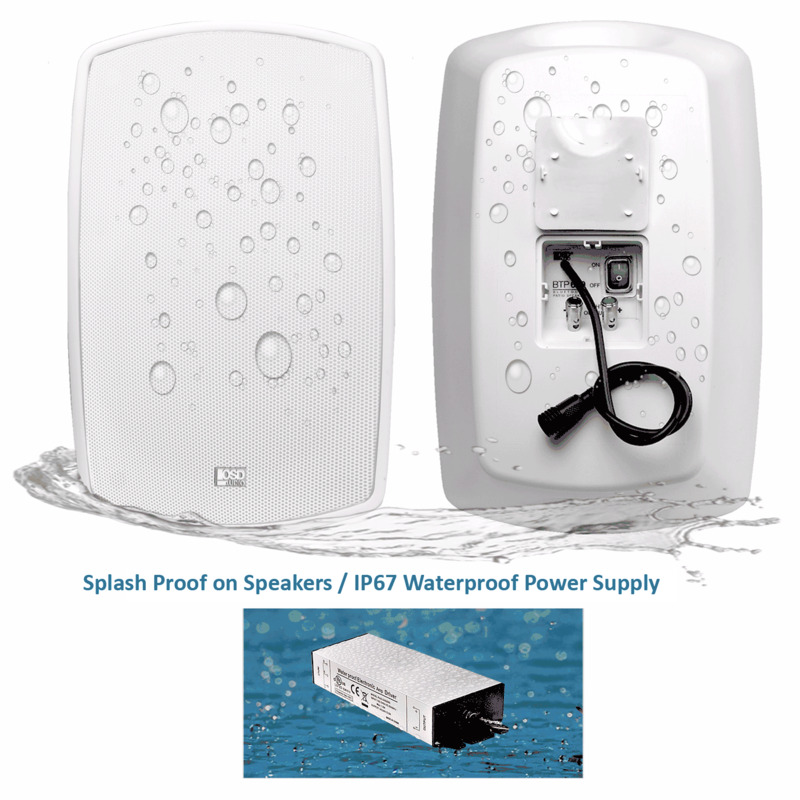 Do the speakers need to be fully charged prior to pairing them to your bluetooth device? I set them up, plugged the power cord into the outlet and tried to pair. However, I did not see the speakers show up on my device. Is there a line input on the master speaker? 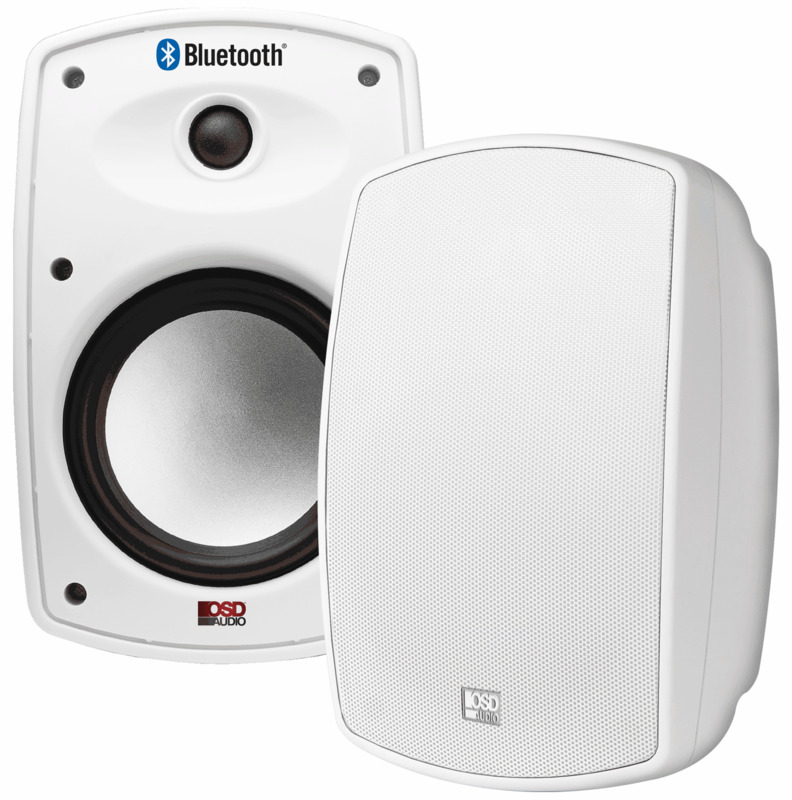 Can i connect 2 pairs of these speaker? And how would the connection? I live in Florida, near Atlantic coast. Will salt air have any quick effect on these? Covered but open patio, high on inside wall?